On Oct. 9, Haddonfield football head coach Frank DeLano recorded his 100th career win, as the Bulldawgs shut out Woodbury, 35–0. Following the game, the Haddonfield community honored DeLano for his achievement. However, DeLano doesn’t see the milestone as an individual accomplishment. “Individual recognition is a direct result of team success and this is no different,” DeLano said. DeLano’s milestone was a proud moment for Haddonfield football. The program has enjoyed lots of success during DeLano’s tenure, winning three South Jersey Group II championships in the past five seasons. When DeLano was hired as head coach in 2002, winning was not a regular occurrence for the Bulldawgs. The team had only made two playoff appearances and won one playoff game in the previous 15 years. The school had won 12 South Jersey championships, but all of them came in the pre-playoff era. Its last championship season had been in 1970. 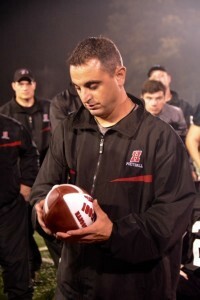 DeLano, only 25 years old when he was hired, had been an assistant at Haddonfield for the past four years and had a plan to change the program’s culture. To turn the team into the consistent winner it is today, DeLano knew he’d need the involvement of the entire Haddonfield football community. 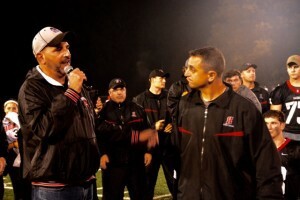 This went from the Haddonfield athletic department and coaching staff all the way down to the Haddonfield Youth Football program, where DeLano worked with the program’s coaches to plant the seeds for the high school program. DeLano got the youth program working on similar schemes, plays and drills the high school team used to have the players mentally prepared to play for the Bulldawgs. Success did not happen overnight for Haddonfield. The team won 14 games in DeLano’s first four seasons and failed to win a playoff game. However, things began to turn in 2006, when Haddonfield got into the South Jersey Group II playoffs as a №7 seed and stunned №2 seed Deptford in the first round, 20–17. The Bulldawgs returned to the playoffs in 2008. In 2009, they reached the South Jersey Group II championship game, losing to Delsea. Haddonfield would get over the hump and win its first championship in 40 years the next season, beating West Deptford for the South Jersey Group II championship. Now, Haddonfield football is a perennial contender in the Colonial Conference. The Bulldawgs clinched an eighth straight winning season with a win over Lindenwold on Oct. 16. The team sits near the top of power points in South Jersey Group II and will have a chance at a third straight championship later this fall. DeLano noted participation in the youth program has also increased dramatically from when he took over in 2002. He doesn’t want to take credit for the changes, instead giving that to dozens of coaches, parents, volunteers and players. DeLano also shares the milestone with the rest of his coaching staff, many of whom have been with him through most of his tenure. When talking about 100 wins, the focus always shifts back to the team. DeLano said he’s spoken to many people whom he’s interacted with over the past 14 seasons, including many of his former players. He wants them to know they played an important part in building Haddonfield football.